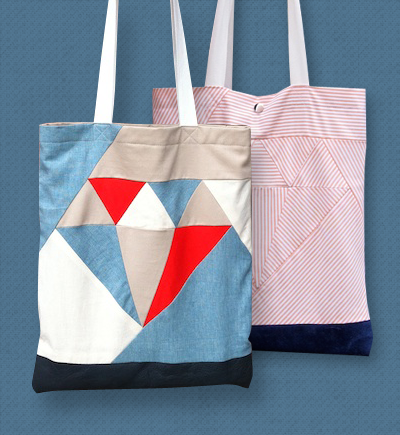 Check out this cool diamond tote bag tutorial with a free PDF pattern, available right here at Misusu. The pattern was created by Elles, a Dutch fashion designer and passionate DIY-er. She plans to open a shop soon full of PDF baby & toddler DIY patterns. By the looks of things, it should be lovely! Not really... though I love bags dearly. This is so cool! I would love to have one of them. Maybe I need to learn how to sew. These bags are so cute. I was just looking at the patchwork shapes at first & then the diamond popped out at me, a fun surprise. Very nice. I bet this would look very neat worked up in leather. Oh, wow. Been waiting for something to do with my additional yardage of Outside Oslo... I think I might figure out how to work the diamond into some placemats! Cool. Or maybe I need a bag. Or both! They are really cute! I love the pattern. Great find! This is really cool having a pattern mean easy to do and i can see now how beautiful it is when its done. :D Thank you so much for posting, keep up the good work!